As I write this, the eyes of the world are focused on the mesmerizing river of crude oil that is incredulously still pumping thousands of barrels a day into the northern reaches of the Gulf of Mexico, enveloping and poisoning everything it touches. The headlines are filled with graphic images of oil clad sea birds, drowned turtles, beaches covered in sticky black globules and marshlands clogged in a reddish brown blanket of death. It is both a sad and angering picture. Recriminations fueled by a collective feeling of helplessness, reverberate from coffee shops to courtrooms, but to me the finger pointing is irrelevant. At every level, people and organizations have mobilized to contain the slick and rescue as many air breathing animals as possible. The size and scope of the terrestrial effort is comforting but below the surface there is little that anyone can do. 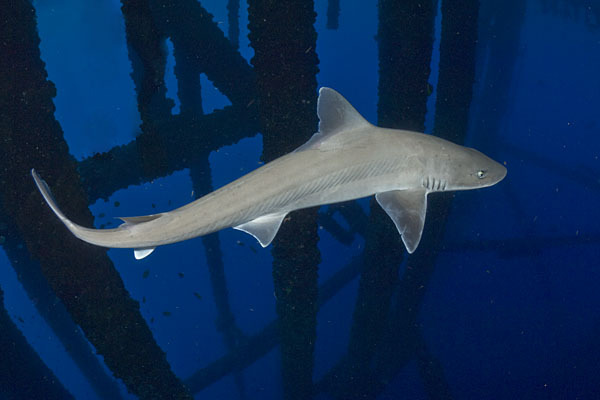 The northern gulf is a critical deep sea habitat. Ironically, the oil rigs that pepper the continental shelf and are now the cause of so much devastation, are also oases of life that harbor complex and vibrant ecosystems. Colonies of immobile invertebrates cling to every wire and strut, feeding an army of crustaceans, mollusks and reef fishes. Enormous clouds of tiny bait fish morph from one shadow to the next and are preyed upon by schools of snappers and other teliost species which in turn support large aggregations of silky and dusky sharks. 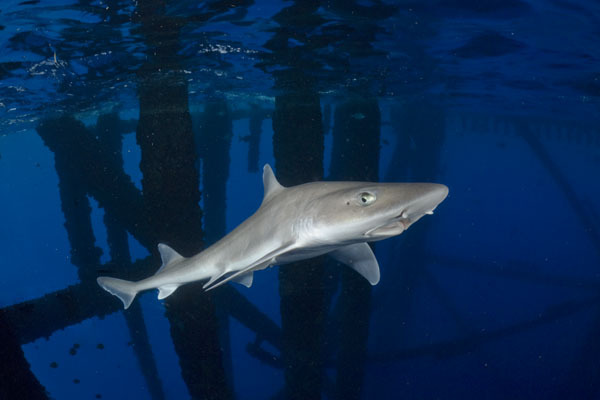 Perched between the apex predators and lesser life forms, small endemic shark species such as the Gulf of Mexico Smoothhound Shark (Mustelus sinusmexicanus) jockey for position in the food web. 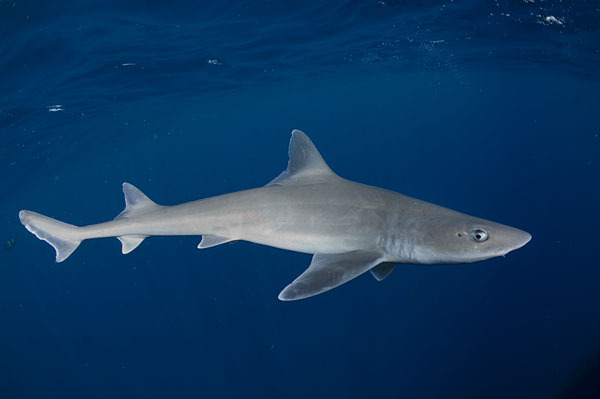 The first and only time I encountered a Gulf of Mexico Smoothhound, I initially thought that it was a smooth dogfish (M.canis) which is a closely related, wide ranging resident of the eastern seaboard. When I later learned that is was a virtually unknown species confined to a tiny patch of seafloor in the northern gulf, I felt equally surprised and privileged to have had the chance to encounter it. I was aboard a research vessel at the time and the tiny shark was pulled from the depths for study amidst a large assortment of other interesting abyssal fishes. 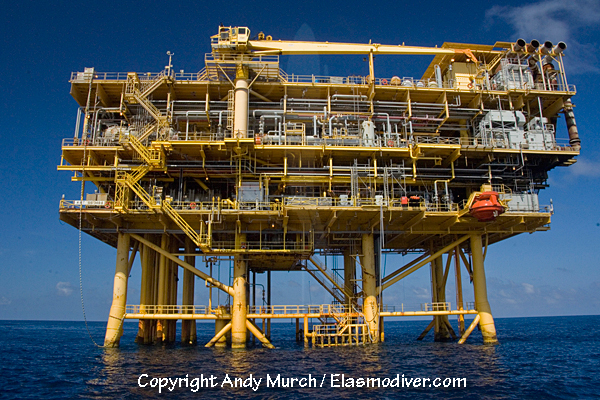 After the lab coats had taken fin clips for DNA analysis and generally had their evil way with the hapless shark, I slipped into the water and swam it over to the oilrig that we were tied off to. When I released it into the shadowy depths, it swam tentatively at first as if not trusting its liberty. Then, after eying me cautiously, it headed for a barnacle encrusted crossbeam and began weaving its way down to the sea floor six hundred feet below. The images that I took of that little smoothhound shark have been haunting me ever since I heard about the spill. I am optimistic that most pelagic sharks had the wherewithal to swim south at the first bitter taste of oil. 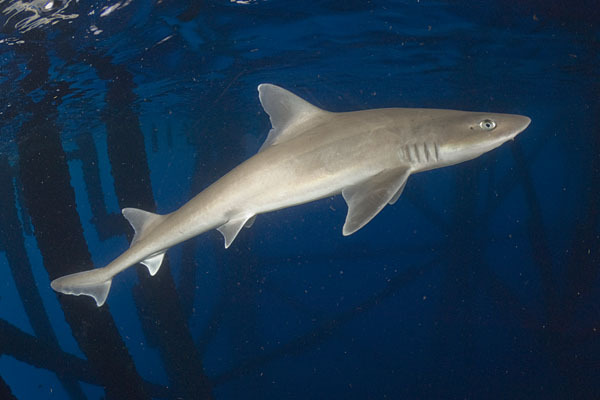 But, what has become of vulnerable endemic species like the gulf smoothhound? Did they all flee into open water like land animals running from a forest fire or did they cling to the habitat they know, inadvertently exposing their delicate gill structures and other organs to the viscose residue floating around them in the water column like a giant toxic lava lamp? After the Exxon Valdez disaster in Prince William Sound, the composition of marine life within range of the spill was changed forever. Some species quickly bounced back while other once plentiful creatures remained severely depleted. Pink salmon populations displayed stunted growth and sea otters and ducks showed higher than normal mortality rates in subsequent years (partially because they ingested prey from contaminated soil). There were no studies done on shark mortality in those isolated Alaskan waters because dead sharks invariably sink. However, there must have been casualties up and down the food chain. Sharks are famous for their capacity to overcome almost all environmental threats (other than overfishing). Female sharks held in isolation in aquariums have even procreated without the aid of a mate. But for a small endemic species like the gulf smoothhound whose entire habitat is under siege, a dislocation of this magnitude could presage its demise. There are no refugee camps or rehabilitation centers in the ocean but sharks are resilient creatures. They are resistant to toxins and blessed with keen spatial senses that will help them find their way back to ground zero once the deluge is finally under control. But for those that fled and survived the initial spill, the question remains, what kind of brave new world will they be returning to?